COLUMBUS -- There are high expectations for the Columbus Blue Jackets after a strong finish to the 2014-15 season. But even with a 12-0-1 finish, the Blue Jackets' 42-35-5 record left them nine points shy of qualifying for the Stanley Cup Playoffs in the Eastern Conference. "You can't just pick up where you left off," defenseman Kevin Connauton said. "But that run at the end of last year shows our potential." The Blue Jackets, who went 15-1-1 in their final 17 games, stood pat on defense but made a major move up front on June 30 when they acquired left wing Brandon Saad, 22 and already a two-time Stanley Cup champion, from the Chicago Blackhawks for four players, including forwards Artem Anisimov and Marko Dano. Columbus' playoff aspirations last season were squashed by an NHL-high 508 man-games lost to injuries, a contributing factor to a 6-15-2 start that the Blue Jackets were never able to overcome. "I know one thing: We're healthy, so that's a real strong improvement for us," president of hockey operations John Davidson said. The addition of Saad (23 goals and 52 points in 82 regular-season games in 2014-15; eight goals and three assists in 23 playoff games) bolsters an already strong offense. "The thing I love about it is he's a young kid we've got for a lot of years," captain Nick Foligno said. "He's going to grow here. It's probably a different role than he's used to in Chicago, but he's fully capable of it." The Blue Jackets' 227 non-shootout goals (2.77 per game) last season were a team record. Columbus showed its arsenal once it got healthy by scoring at least three goals in each of its final 13 games. 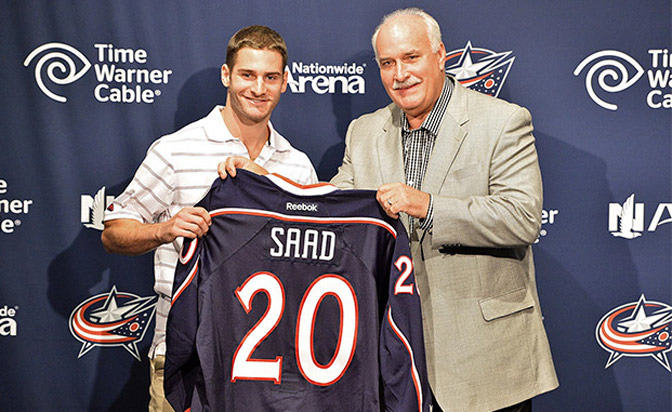 "Everyone wants to get better and push themselves," Saad said. "This is another challenge." His probable center is Ryan Johansen, 23, who missed all of training camp last year before signing a new contract. Yet he and defenseman David Savard were the only Blue Jackets to play all 82 games. Johansen, who played in the 2015 All-Star Game, was second in points for Columbus (71) and third in goals (26). "I feel like I'm a guy that's looked at as being a difference-maker for this team," he said. "When I'm on top of my game, I'm a huge help." Foligno, named May 20 as the Blue Jackets' first captain since 2012, had 31 goals last season, 13 more than his previous career high. He also had 42 assists, led Columbus with 73 points and earned his first All-Star Game appearance. Scott Hartnell's 28 goals in his first season with Columbus were the most he scored since he had 37 for the Philadelphia Flyers in 2011-12. He was joined in the 20-goal club by Cam Atkinson (22). It's evident the Blue Jackets need Brandon Dubinsky and Boone Jenner at full strength. Dubinsky missed 35 games but still had 13 goals and 36 points. Jenner had nine goals and eight assists despite missing 51 games. The Blue Jackets were 11-0-2 when they were in the lineup together. Matt Calvert endured an injury-plagued season in which he had 13 goals and 23 points in 56 games. The Blue Jackets are deep enough that Hartnell and Atkinson could end up on the third line, and the bottom of the forward rotation might be stronger than ever with the additions of veterans Rene Bourque, Gregory Campbell and David Clarkson. Clarkson, 31, was acquired from the Toronto Maple Leafs on Feb. 26, but he played three games before sustaining a torn oblique that cost him the rest of the season. "He's hungry," general manager Jarmo Kekalainen said. "He wants to prove to everybody that he's still a good hockey player. We believe he can be." Bourque, 33, is trying to resurrect his career after being traded by the Anaheim Ducks to Columbus for defenseman James Wisniewski on March 2. Bourque had four goals in eight games for the Blue Jackets before a season-ending stress fracture in his back. Campbell, 31, signed as a free agent July 1 after five seasons with the Boston Bruins. He was a member of their Stanley Cup-winning team in 2011. "You need momentum swings from every line, and I think we're going to get that this year," Foligno said. Topping the list of young players pushing for playing time is second-year center Alexander Wennberg, 21, who is expected to take Anisimov's spot on the third line. Wennberg had four goals and 20 points in 68 games but showed marked improvement after his second call-up from the American Hockey League. Josh Anderson (0-1-1 in six games) and Kerby Rychel (three assists in five games) got limited exposure as rookies last season. William Karlsson had a goal in three games after coming to Columbus in the Bourque trade. Recent draftees Sonny Milano (16th, 2014) and Oliver Bjorkstrand (89th, 2013) each hope to make his NHL debut this season. Bjorkstrand was the Western Hockey League's player of the year last season and scored 144 goals the past three seasons for Portland. Foligno said there is no reason Columbus should miss the playoffs. "That's not even an option, and it's never going to be a thought in our room," he said. The Blue Jackets were 25th last season in non-shootout goals allowed with 248 (3.02 per game) and did not make any changes on defense. Coach Todd Richards isn't concerned about critics who say they made a mistake by standing pat. "There's a lot of talk around the League questioning our defense," Richards said. "I don't question our defense at all. I'm 100 percent confident in our group. I hope they use that as a motivational tool." All discussions begin and end with Ryan Murray. The third-year player was injured most of last season and played 12 games. He also missed 16 games in his rookie season. But when Murray is healthy, he's Columbus' best defenseman. "I'm like an expectant father with him," Davidson said. "He's a very, very, very good hockey player." Murray, who turns 22 on Sept. 27, is part of a group that includes his likely partner, Savard. The 24-year-old signed a five-year, $21.25 million contract extension on Sept. 8. Savard led Columbus defensemen last season with 11 goals and 36 points. Connauton, Justin Falk, Cody Goloubef and Dalton Prout all are 26 or younger. The "older" players are Jack Johnson, 28, and Fedor Tyutin, 32. "We don't have any All-Stars; obviously Jack is up there, but for the rest of the D corps, we're really good D-men that can do a little bit of everything," Savard said. "If we do our job, we'll be fine." That doesn't mean the defensemen don't know what's being said about them. "As a younger group, we're motivated because we've got a lot to prove," Connauton said. "You read the headlines that there's not much faith in us coming from the media and outside our locker room. It makes us hungry and pushes us to get better." Savard has an answer for those wondering how the defense will fare. "We've got the best goalie in the League, so I don't think it's a problem even if we don't have the best D corps in the League," he said. Savard is referring to Sergei Bobrovsky, who like so many other Blue Jackets had to battle through injuries last season. The 2013 Vezina Trophy winner was 30-17-3 with a 2.69 goals-against average and .918 save percentage. But it was his play after returning in March from a groin injury that has the Blue Jackets optimistic; he finished by going 14-2-1 in his final 18 games. Bobrovsky, 26, has been working with goaltending coach Ian Clark on refining the in-season routine that may have led to several groin injuries the past two seasons. "You have to be smart and find the balance between work and rest," Bobrovsky said. "It comes with experience. You want to be the best. You want to work every night. Sometimes it causes you some problems." Backup Curtis McElhinney (12-14-2, 2.88, .914) returns for a third season after signing a two-year extension. "Curtis is a guy we trust," Richards said. The Blue Jackets' 19.3 percent success rate on the power play (53-for-280) was fifth in the NHL. Wisniewski contributed seven goals and seven assists from point, and his big shot will be missed. But Savard is being counted on for more than three power-play goals, and Connauton should produce more than three power-play assists. Foligno led the Blue Jackets with 11 power-play goals, and Hartnell had eight. Saad scored three for Chicago, but his ice time with the extra man should increase with Columbus. The Blue Jackets allowed five shorthanded goals (tied for 11th) and scored five (17th). Columbus was 23th on the penalty kill at 80.2 percent. Johansen scored two shorthanded; Atkinson, Dubinsky and Mark Letestu each had one. Campbell is expected to take over for Letestu, who signed with the Edmonton Oilers. Richards is back for his fourth full season. He was named interim coach on Jan. 9, 2012, and got the full-time job four months later. He has a 127-105-21 record in 253 games with the Blue Jackets, including back-to-back 40-win seasons. His wins total and .543 winning percentage are the best in Blue Jackets history. Richards also coached the United States to a bronze medal at the 2015 IIHF World Championship and was an assistant for the U.S. at the 2014 Sochi Olympics. His staff of associate head coach Craig Hartsburg, assistant coach Brad Larsen and Clark is intact, and Kenny McCudden was added after 16 seasons as the skating and skills coach of Chicago in the American Hockey League.